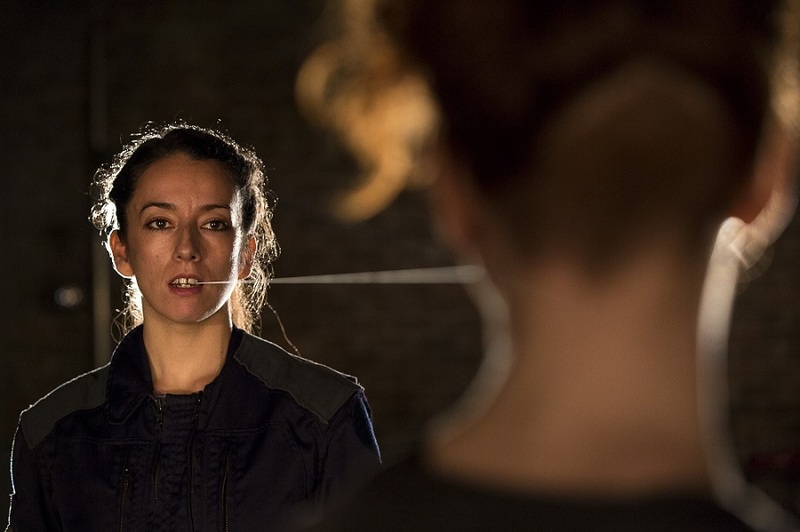 Things untangle, things change: Andrew Edwards is mesmerised by Saffy Setohy’s “hugely generous” new performance installation at Dance International Glasgow. Hidden Architectures, Dance International Glasgow. Photo: Julia Bauer. Hidden Architectures is, on the face of it, quite a simple piece of work. There are three pairs of performers connected mouth-to-mouth by a thin wire, and the vast majority of the performance is given to exploring how this effects their movement, their shuffling back and forth, their twisting left and right, their tangling and untangling, always connected to something, always anchored to the world. These connections appear to us both as a constraint and a liberation, a factor that narrows what’s possible but also acts as a hugely generative base from which to explore such narrow confines. There’s an incredible certainty to the work, a confidence in the potentials of this choreography. This belief carries over to its audience and, watching on, it’s easy to become invested, easy to speculate, easy to follow the flow of movement. Hidden Architectures is easy to watch, and that’s good, I think. This sense of ease is best articulated in the moments when the six performers, and three duets, tangle together. Moving into a circle with a knot at the centre, they appear stuck, bodies sort of jutting, heads pecking with frustration. As an image, it is affecting to anyone who has ever felt tangled by social relations, or perhaps anyone who has ever tried to accomplish anything with other people. And that’s pretty much anyone. And then in three quick movements they are untangled, floating again as duets within the space. They repeat the trick several times and each time it feels like magic. You watch it, figure out the steps, and then feel surprised all over again by the ease with which the knot is untangled. Hidden Architectures, as a work about social relations, never dwells too long on one moment, never lets itself focus overwhelmingly on tensions, frustrations, the butting of heads. Instead it moves with lightness. Things untangle, things change. Choreographer Saffey Setohy and composer Jan Hendrickse have created a space in which these lines are made readable in multiple ways, gesturing towards the many architectures of place, towards the structures through which our presence is negotiated with the wider environment. Each line connecting performers is amplified at one end, creating a score that emerges from the oral cavity and constructs a different way to access the space. The noises produced are beguiling, dull thuds that are comfortable, predicted, and sharp scrapes, frictions and erosions that really get into your spine. These sounds offer another way to read architecture, making acoustic what Henri Lefebvre describes as the rhythms of place, those patterns of movement and time that are scaffolding to the world. Throwing possibly too much theory into one review, the work makes me think most clearly about the centrality of movement in place-making, a process of mutual emergence between moving bodies and moving landscapes. The architectures presented to us tonight at SWG3 are fluid, built through and on things that move; things like lights, bodies, time and air particles. Presented in the context of an urban space, a concrete room within the city of Glasgow, this interconnected, kinetic form of place-making is perhaps the one we all more readily identify with, an idea of place, of feeling in some way bound to the environment, that is not dependent on staying within the same space. Hidden Architectures is a piece of work that is simple only at first glance, that slowly reveals itself to be hugely generous, perfect for watching and mulling over how you relate to the world. Hidden Architectures was at Dance International Glasgow until May 10th. For more details, click here.